A Case of Severe Cognitive Dissonance? Moderate-to-strong El Niño events in the New Moon epochs preferentially occur near times when the lunar line-of-apse aligns with the Sun at the times of the Solstices. Moderate-to-strong El Niño events in the Full Moon epochs preferentially occur near times when the lunar line-of-apse aligns with the Sun at the times of the Equinoxes. Astonishingly, there has been almost no response from the climate science community concerning these important findings. This terrible state of affairs persists even though there is overwhelming evidence that the Perigean New/Full tidal cycle must play a role in instigating moderate-to-strong El Nino events. 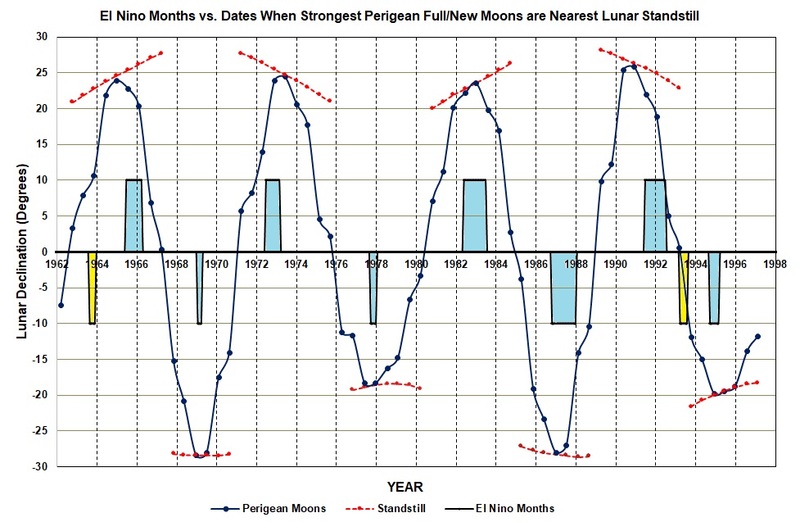 The following graph shows the astronomical declination of the strongest Perigean New/Full Moon between 1962 and 1997 (solid blue line)(1). These are the strongest lunar tidal events during the 5th (New moon) Epoch that spans the period between the 23rd of April 1963 and the 25th of April 1994. The declinations of strongest Perigean New/Full Moons reach their maximum distance from the Celestial Equator once every 4.425 (= 8.850 / 2) tropical years, as a result of the slow prograde precession of the lunar line-of-apse with respect to the stars. In addition, the graph shows the declination at which the Moon reaches lunar standstill near the times of the strongest Perigean New/Full moon events (dashed red lines). A comparison between the timing of El Nino months and the times at which the strongest Perigean New/Full Moons approach lunar standstill, clearly show close alignments for eight out of ten of the moderate-to-strong El Nino events. It is absolutely amazing that the climate community is ignoring such clearcut evidence in favour of the hypothesis that the 31/62-year Perigean New/Full moon tidal cycle is the trigger for moderate-to-strong El Nino events. Smith, C.A. and P. Sardeshmukh, 2000, The Effect of ENSO on the Intraseasonal Variance of Surface Temperature in Winter, International J. of Climatology, 20 1543-1557.